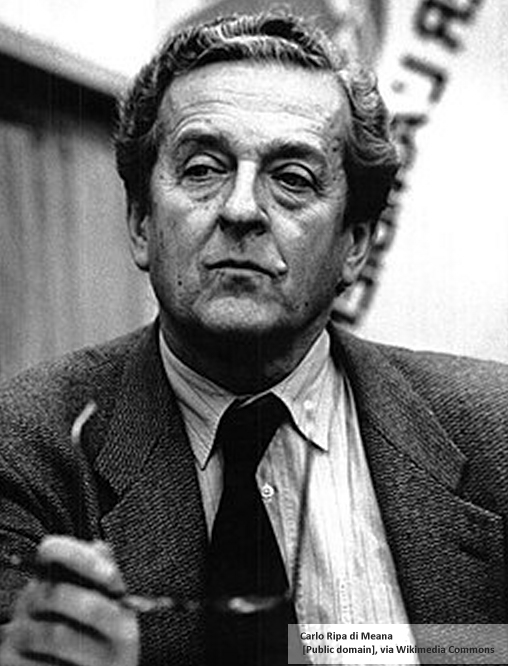 In 1992, Carlo Ripa di Meana was the European Commission Envioronment Commissioner. He called for cities to be free of cars he said he was ready to become car-less, and so should other city dwellers, to prevent Europe’s cities being choked by the internal combustion engine. Last month, Carlo Ripa di Meana, the EC environment commissioner, unveiled plans to shift cars out of urban areas. It was a question of making the transition from ‘the car dream to the dream city – the car- less city’ he said. He was even ready to live without his own Alfa Romeo, he added. Sadly, the EC decided it could live without Mr Ripa di Meana, and he is now back home in Rome. The EC environment portfolio is temporarily under the wing of another commissioner – Mr Van Miert. One immediate effect of reducing the use of cars is to spend less on consumption. This causes production to fall reducing GDP. 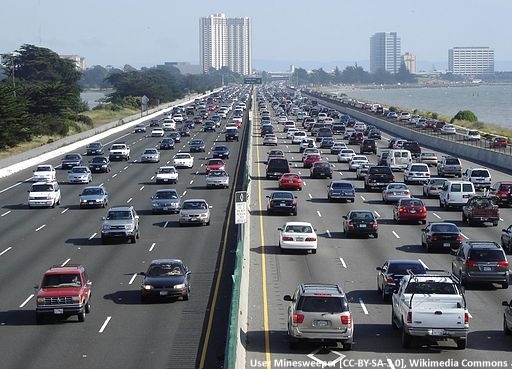 CO2 emissions are reduced because of lower emissions from driving cars and manufacturing them. Dividing global GDP by global CO2 emissions gives something called the global intensity of production. Over the past 45 years this has been falling steadily. 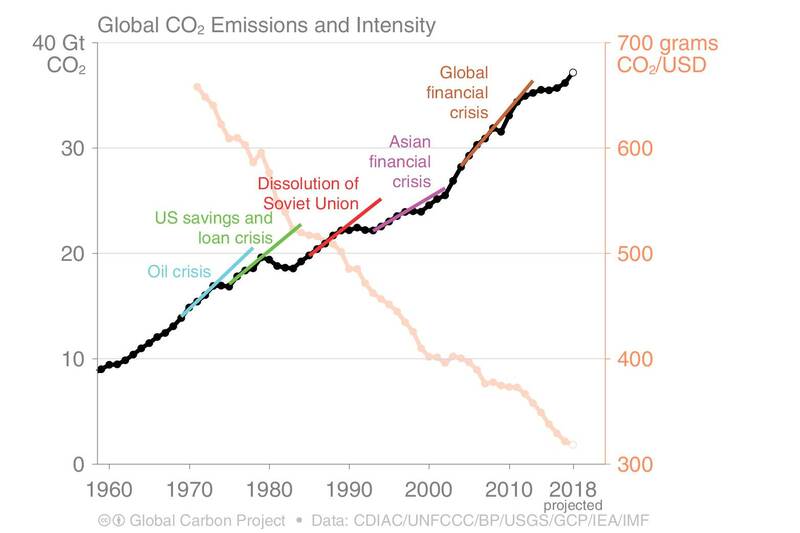 For every unit of production, (measured in inflation adjusted US dollars) the amount of CO2 produced has decreased from 665 grams of CO2 emissions to 315 grams, as shown in the pink line of Figure 1. This measure has decreased more or less linearly with time. If the trend were to continue it would become zero in about 2060. By definition, global CO2 emissions are global GDP times the intensity of production so in 2060, this simple model predicts that CO2 emissions will also be zero. Efforts to decrease the intensity of production are made by changes like switching electricity generation from fossil fuels to renewables. There is a hope among governments that it can be made to fall at a faster rate and reduce CO2 emissions even faster – fast enough to stay within “sensible” carbon budgets – and allow for economic growth. A simple test of these hopes is to calculate the total carbon emissions for the simple case where global GDP remains static until 2060 and carbon intensity keeps falling at the same rate. It’s not difficult. From now until 2060 is 42 years. The current emissions are 37.1 billion tonnes per year so the total CO2 emitted is 779.1 billion tonnes CO2. (37.1*42/2 == 779.1). If land use change of 5 billion tonnes of CO2 caused by land use change are modeled in the same way that becomes 882.0 billion tonnes CO2. Analysis: How much ‘carbon budget’ is left to limit global warming to 1.5C?. They showed various estimates of the allowable carbon budget to keep temperatures well below 1.5°C, where “well below” implies a 66% chance of keep temperatures below 1.5C warming (and a corresponding 33% chance of exceeding the target). The estimates ranged from 67 billion tonnes CO2 to 779 billion tonnes CO2. So my estimate of 779.1 billion tonnes, which excludes the effects of land use change, exceeds all of the wide range of allowable carbon budgets that Carbon Brief reported. A mid range estimate reported for the 1.5°C remaining carbon budget was from a paper by Tokarska & Gillet. It is 395 billion tones of CO2 (395 GtCO2). Raising that by 18% to account for other greenhouse gasses gives 466 GtCO2e. The current world population is 7.68 billion so if this remaining carbon budget were divided equally among the word’s population, we would each have a personal remaining carbon budget for a 1.5°C of 51 tonnes CO2 (or 61 tonnes CO2e). Unless carbon intensity can be reduced much faster than it has done in the past 45 years, the only way to stay within these budgets is to reduce world GDP i.e. degrowth. Measured on a consumption basis, typical personal emissions in a car owning household in the UK are around 15 tonnes CO2e/year. This exceeds the 1.5°C budget of 61 tonnes CO2e in about 4 years. To get close to this budgets we need different approaches to town planning. Ones which design life styles that fit within planetary boundaries and are are pleasant enough to make life worth living. We must remove most personal vehicles that weigh 1 tonne and travel at 100kph. If personal vehicles are needed, let’s try ones that weigh 100 kgs and travel at 25 kph. This will help to design out urban sprawl. My purpose in coming here is to indicate why I think there may be a strong case for drastic traffic suppression in York. One immediate criticism that can be made of this view is that it fails to distinguish between technical means (in this context the different forms of transport available) and the human values (Like mobility, quietness, visual beauty and community spirit) which should be the aims of the planning process.